Arrow Bookends appear to float in mid-air as they hold your books upright. The secret to this gravity defying illusion is a metal holder hidden in the last book cover – to which the magnetic arrow is automatically drawn. Perfect for book lovers everywhere. 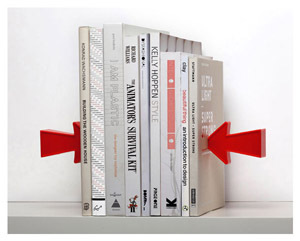 Arrow Bookends are ideal for keeping your books upright on shelves or your bedside table. Use them to add interest to your books or display your favourite titles. Manufactured in plastic and metal. Chat Plates are ideal for entertaining. Great food and conversation are the perfect ingredients for a dinner party. Now, not only can your delicious food do the talking – but even your plates will become conversation pieces. 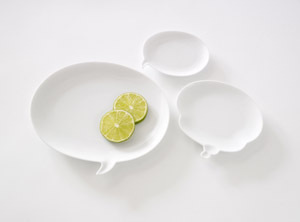 Designed by Ikuko Nakazawa, Chat Plates are inspired by the conversation bubbles in manga or Japanese comics. The plates come as a set of three: one medium and two smaller sized plates. Manufactured in porcelain, they are dishwasher and microwave safe. Dimensions: Medium plate – 19 x 15.5cm Small plates – 12 x 10.5cm and 10 x 8cm approx.